If you don't use your inhaler the right way, much of the medicine may end up on your tongue, on the back of your throat, or in the air. A spacer or valved-holding chamber can help keep this from happening. 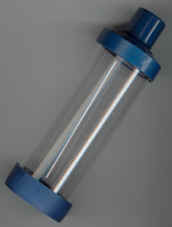 A spacer or valved-holding chamber attaches to the inhaler. It holds the medicine in the chamber long enough for you to inhale the medicine in one or two slow, deep breaths. 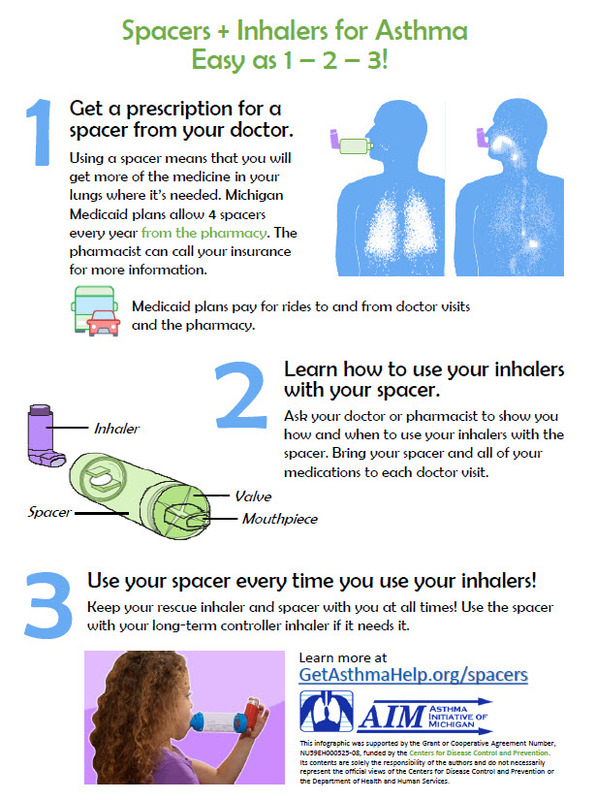 A spacer will help keep you from coughing when using an inhaler. A spacer will also help prevent you from getting a yeast infection in your mouth (known as thrush) when taking inhaled steroid medicines. Using a spacer or holding chamber with a mouthpiece is best, but if a young child or adult is unable to use one a face mask works well. Many brands of these devices and their masks are now on the Medicaid Plan Common Formulary (pages 116-118) so picking up a spacer/valved-holding chamber at the pharmacy along with your inhalers is even easier. All of the Michigan Medicaid plans allow up to 4 spacers/valved-holding chambers per year, with no prior authorization. Learn more about getting a valved-holding chamber or spacer. To use a spacer or valved-holding chamber, first read the instructions that came with it, since there are many types available. Use the general instructions below to help you get the most from your MDI. See a video that shows how to use an MDI with a spacer correctly. Remove cap from metered dose inhaler (MDI). Holding MDI upright, place in end of holding chamber. Shake the MDI and chamber three to five times. Put your mouth around the holding chamber mouthpiece. Squeeze down on the MDI to send the medicine into the holding chamber. Breathe in slowly and completely, for three to five seconds. Hold your breath for about ten seconds. Repeat as your doctor or asthma educator tells you to do. Wait one minute between puffs. For children who are not able to use a mouthpiece (under age 4 – depends on child), a facemask can be used with the MDI. Shake the inhaler and prime it (if needed), then insert into the back of the chamber. Have the child sit on an adult's lap, make sure there are no small objects inside the chamber, and gently place the mask over the child’s mouth and nose (the child will be able to breath normally). 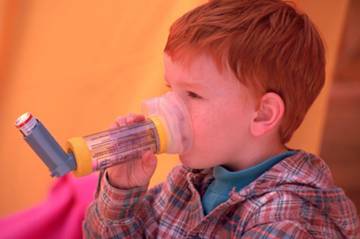 Pump the inhaler once and hold the mask in place as the child breaths in 6 times. If more puffs of medicine have been prescribed, repeat these steps. The child has gotten the medicine if his/her chest moved in and out for 6 breaths or a hand, placed the child's belly, moved up and down 6 times. Hand wash the chamber with face mask once a week with warm water and dishwashing soap. Rinse gently with warm water and let air dry (do not use a towel). Replace if chamber gets cracked or broken. Adapted from How to Use Your Metered-Dose Inhaler the Right Way, found in the Practical Guide for the Diagnosis and Management of Asthma, NIH Publication No. 97-4053, October 1997, National Institutes of Health, National Heart, Lung and Blood Institute. Pictures courtesy of Institute for Health Studies, Michigan State University.